The term “biscuit”, derives from the Latin “bis coctus”, meaning “twice baked”, which is essentially what many types of biscuits are. The term first showed up in English around the 14th century. In America, the term biscuit now pretty much only means a small, quick rising, soft bread product. 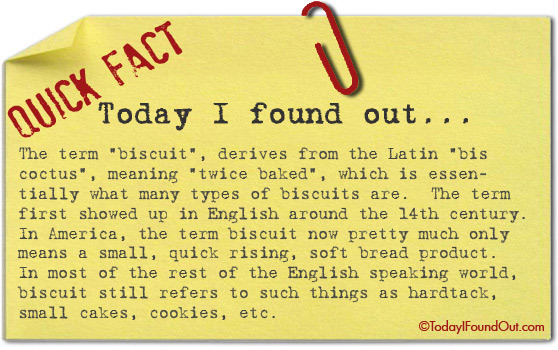 In most of the rest of the English speaking world, biscuit still refers to such things as hardtack, small cakes, cookies, etc.